In addition to the scale replica of CMC Aston Martin DB4 GT Zagato, 1961 (Item No. 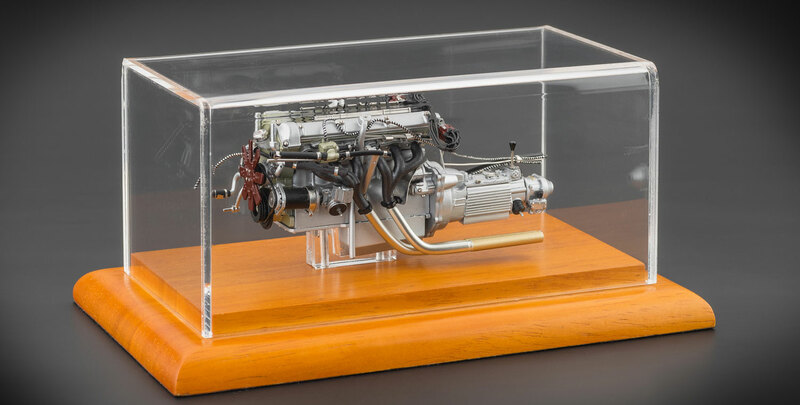 M-132 and M-139), CMC offers its engine as a collector’s item that stands all by itself. liters (3,670 ccm) and a compression ratio of 9.7:1. With an output of 314 hp at 6,000 rpm, this motor unit accelerates the DB4 GT Zagato from 0 to 100 km/hr in 6.2 seconds. inverted valves (two for each cylinder). The ignition system consists of two distributors placed at the rear top flange of the engine block unit. For efficient combustion, each cylinder is installed with two spark plugs. Mixture formation is ensured by three Weber dual carburetors 45 DCOE4. For oil feed, pressure lubrication is also adopted. A separate oil cooler keeps oil temperature within permissible limits. We are pleased to present this highly detailed motor unit as another gem in CMC’s line of high-end miniatures.